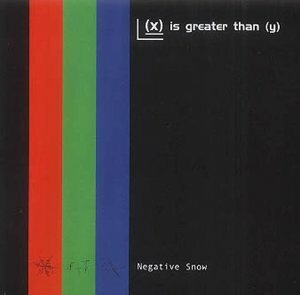 Following on from last years singles (‘S.G.W.’ and ‘Mirrors And Cameras’, both included here) April will see (X) IS GREATER THAN (Y)’s debut album – ‘Negative Snow’. (X) IS GREATER THAN (Y) are full of relentless energy and invention. The sound of ‘Negative Snow’ is seemingly inescapable once played, seeming to fill space about you. (X) IS GREATER THAN (Y) have experimented with the sounds at their disposal, and to great effect, as instruments are given an other-worldly life of their own along with explosive power. ‘Negative Snow’ shares a musical rebellious streak with people like My Bloody Valentine or the more recent No-Wave bands in the U.S. Each track draws you in, whilst descending into a barely controlled chaos; it’s a hard to explain the power that is evoked. Intense, powerful and running on adrenaline from the first note, (X) IS GREATER THAN (Y) are not for the faint hearted.